This book, edited by Professor Volker Scheid and Dr Hugh MacPherson, examines the opportunities and challenges of integrating East Asian medicine into Western healthcare systems from an interdisciplinary perspective. This book was edited by Hugh MacPherson, Richard Hammerschlag, George Lewith and Rosa Schnyer. For independent reviews in Acupuncture in Medicine click here, and Journal of Chinese Medicine click here. 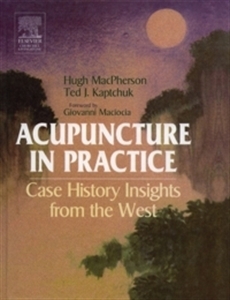 This book was edited by Hugh MacPherson and Ted Kaptchuk. For more details and/or to purchase, click here.